At AAA Fire Protection Services we design and install comprehensive fire suppression systems. Further, we bring more than 40 years of fire protection experience to the clients whom we serve. We are a family owned business that provides Palo Alto and businesses of the Silicon Valley with quality and affordable solutions that address the risk of business fires. We begin our fire sprinkler services by offering full fire sprinkler installation services. That process involves buildings under construction and buildings under renovation. 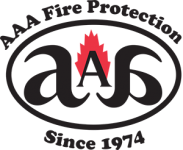 At AAA Fire Protection Services we view our role as a member of your team. As such, we provide seamless collaboration with your design team and architects. Once a fire sprinkler system is designed and installed, we continue to provide fire protection services. With our regularly scheduled fire sprinklers inspections we are able to ensure that your fire suppression system is fully functional. When a system problem is discovered, we provide fire sprinkler repairs. For more information about how to work with our team of experts, just give us a call at (800) 543-5556. We happily provide custom quotes that match your building's needs.